I have blogged before about how one of the reasons I go to conferences is to help find my tribe. I’ve also said that I won’t go to conference unless I know a few people, as that is helps me be an insider, or at least a little connected. Last week I attended two conferences. The first, the ALT-C conference, I definitely felt was not my tribe. I was excited to meet some of my online friends, and excited to be Virtually Connecting with a few people that I had interacted with online and deeply respected. But the conference itself did not align well with my interests. It was very much a conference about Learning Technology in the UK. I don’t live there. I don’t understand the context. And, although I do stuff with online learning, I’m not really that tied to the practitioner focus. I did have some great interactions with people, however, it did not feel like my tribe. The other conference I attended was the Queens University of Belfast ePatient Blogging and Microblogging conference. Here I really felt like I was with my tribe. It is a new tribe for me. I was thrust into the world of being an ePatient when I was diagnosed with breast cancer last year. I immediately began blogging my breast cancer journey. I had some hope that it would be useful from an academic perspective, but I didn’t know what that would be. I knew that there was value in the reporting of lived experience through illness, I just didn’t know where that fit within the realm of academia. It was with that unknown lens that I did my presentation (part testimonial, part research report) – Cancer Blogging – A Survivor’s Journey. It was at this conference that I learned there is a methodology associated directly with the field of study that interests me – pathography, or more specifically autopathography. Dictionary.com defines autopathography as: an autobiography that focuses on or is inspired by the influence of a disability, disease, or disorder on the author’s life. Even more useful, I’ve learned about a field of study called the medical humanities, as well as several academic journals that publish the patients case stories (that is, autopathographies). This next quote is something that I think voices what I’m feeling regarding my illness blogging, my writing, and my desire to make meaning out of it within the context of the medical system. 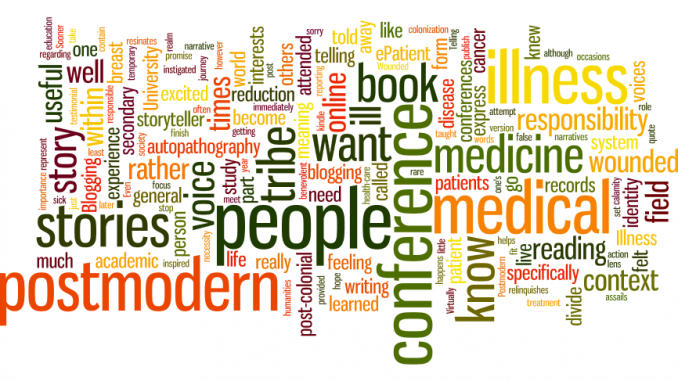 I want my writing (that is my story) to cross the postmodern divide – that is, I want it to have meaning within the context of medicine and medical education. I don’t want it to be secondary to my medical records. I want it to have the same weight as my medical records. Thanks for this Rebecca, began reading Arthur Frank when chemo started but realized the people caring for me were deaf to anything I said or represented as a human. The medical system is a very dangerous place and, ironically, very unsupportive of the basic needs for life to prosper.